I am so pleased to announce that The Honourable Michael Kirby AC CMG has agreed to become The Baird Institute’s 2nd Patron. When he retired from the High Court of Australia on 2 February 2009, Michael Kirby was Australia’s longest serving judge, having worked there since 1996. He continues to undertake many international activities for the United Nations, the Commonwealth Secretariat, the World Health Organisation and UNESCO. Michael Kirby was Chancellor of Macquarie University from 1984 to 1993 and has been appointed Honorary Visiting Professor by 12 universities. He participates regularly in local and international conferences and meetings and has served on many international committees for the UN, the Commonwealth of Nations and on the UN Secretary-General’s High Level Panel on Access to Essential Medicines (2015-16). He is regularly engaged in international arbitrations, domestic mediations and teaching law. This year has flown by once again. Our Heart and Lung Surgery Nurses Education Conference in September this year was a great success. Our speakers and workshop presenters were of the highest calibre; captivating the participants with advances in technology, patient care, and new ways of operating; all underpinned by research. Research has begun in the new Hybrid Theatre in the Charles Perkins Centre with current work being carried out on novel mitral valve surgical approaches. A general research update can be found within this newsletter. Finally please consider joining our Facebook Heart and Lung patient and family support group, “Heart to Heart”. Details on how to join are on page 5 of this newsletter. On behalf of the team at The Baird Institute, we would like to extend our thanks to all our supporters for their continuing trust and support. Best wishes to you and your families for the holiday season and for a very healthy and happy 2019. Click on the above image and download your copy now! We have hit the ground running in 2018, with lots taking place in the first few months of the year. We are really excited to announce our collaboration with a start-up company to develop some virtual reality software which will help in the diagnosis and management of patients with Aortic Dissection, putting us at the cutting edge of surgical innovation. You can read more about this joint venture later in the newsletter. 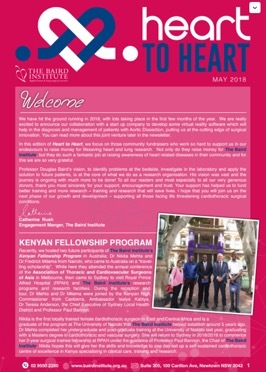 In this edition of Heart to Heart, we focus on those community fundraisers who work so hard to support us in our endeavours to raise money for lifesaving heart and lung research. 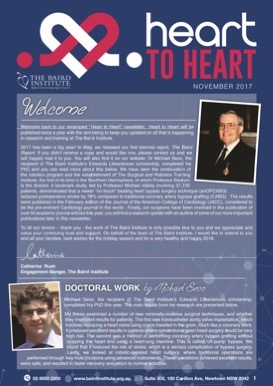 Not only do they raise money for The Baird Institute, but they do such a fantastic job at raising awareness of heart-related diseases in their community and for this we are so very grateful. Professor Douglas Baird’s vision, to identify problems at the bedside, investigate in the laboratory and apply the solution to future patients, is at the core of what we do as a research organisation. His vision was vast and the journey is ongoing with much more to be done! To all our readers and most especially to all our very generous donors, thank you most sincerely for your support, encouragement and trust. Your support has helped us to fund better training and more research – training and research that will save lives. 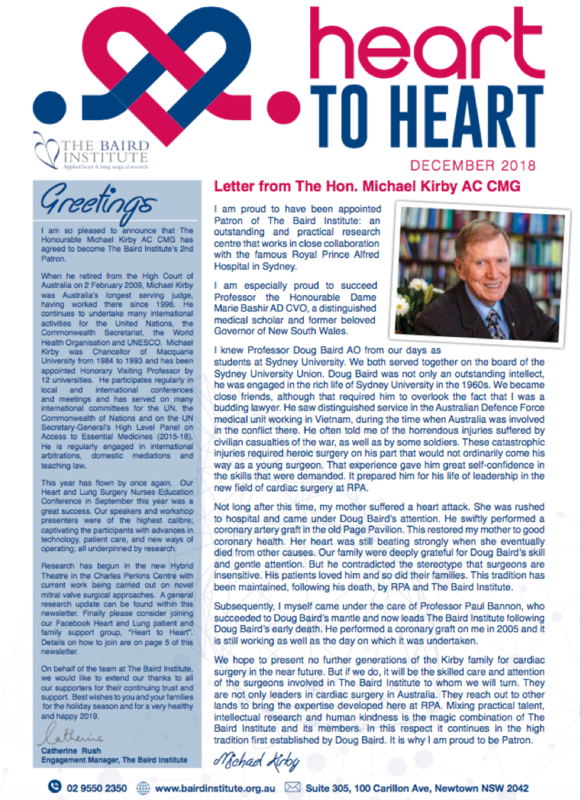 I hope that you will join us on the next phase of our growth and development – supporting all those facing life-threatening cardiothoracic surgical conditions. 2017 has been a big year! In May, we released our first biennial report, The Baird Report. If you didn’t receive a copy and would like one, please contact us and we will happily mail it to you. You can also dowload a copy from the link on the front page of our website. Dr Michael Seco, the recipient of The Baird Institute’s Edwards Lifesciences Scholarship, completed his PhD and you can read more about this in our newsletter. We have seen the continuation of the Robotics Program and the establishment of The Surgical and Robotics Training Institute, the first of its kind in the Southern Hemisphere, of which Professor Bannon is the director. A landmark study, led by Professor Michael Vallely involving 37,720 patients, demonstrated that a newer “no-touch” beating heart bypass surgery technique (anOPCABG) reduced postoperative stroke by 78% compared to traditional coronary artery bypass grafting (CABG). The results were published in the February edition of the Journal of the American College of Cardiology (JACC), considered to be the pre-eminent Cardiology journal in the world. Finally, our surgeons have been involved in the publication of over 50 academic journal articles this year; you will find a research update with an outline of some of our more important publications later in the newsletter. To all our donors, thank you – the work of The Baird Institute is only possible due to you and we appreciate and value your continuing trust and support. On behalf of the team at The Baird Institute, I would like to extend to you and all your families, best wishes for the holiday season and for a very healthy and happy 2018.